According to new analysis by Kingsley Associates, buildings that have earned the BOMA 360 Performance Program® designation have higher tenant satisfaction scores in all 55 rating areas as compared to commercial office buildings without the BOMA 360 designation. 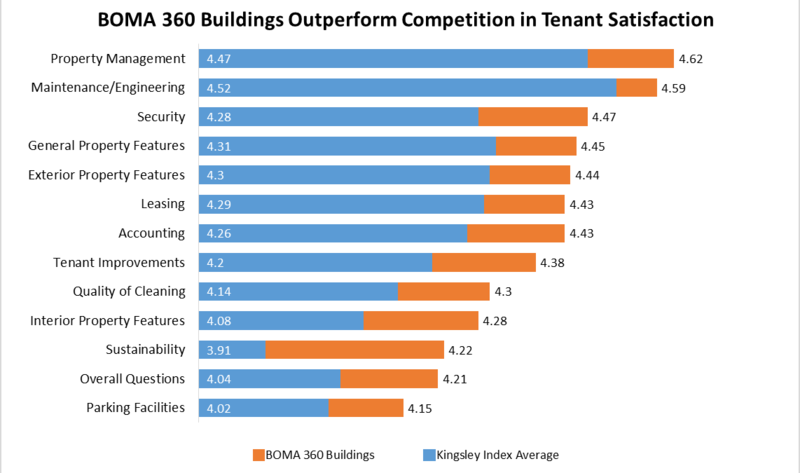 These results continue a multi-year trend of BOMA 360 buildings significantly outperforming those without the designation. Among other findings, tenants in BOMA 360 buildings report being significantly more likely to renew their lease and recommend the property to others. BOMA 360 is a commercial real estate designation developed by the Building Owners and Managers Association (BOMA) International that recognizes all-around excellence in building operations and management. The program benchmarks building performance in six key areas: operations and management; security and safety; training and education; energy; environment and sustainability; and tenant relations. Since the program’s inception in 2009, more than half a billion square feet of commercial space has been designated. Tenants in BOMA 360 buildings expressed high overall satisfaction with property management, scoring the properties an average of 4.49 out of 5 compared to 4.28 in non-designated buildings. BOMA 360 tenants also were more likely to recommend their property to others—a score of 4.47 versus 4.23—and reported higher value for amount paid and stronger intention to renew than tenants in non-designated buildings. Tenants were particularly pleased with the professionalism and courtesy of the building staff in BOMA 360 buildings, scoring them 4.76 out of 5. Likewise, BOMA 360 tenants found their property management teams more accommodating, giving them higher marks for accessibility, communication, problem resolution and responsiveness, with scores ranging from 4.55 to 4.65 compared to scores as low as 4.36 in non-designated buildings. BOMA 360 tenants felt more secure, scoring their buildings higher in quality of security personnel, security policies and procedures, after-hours security and security responsiveness. BOMA 360 tenants rated their overall sense of security 4.46 as compared to only 4.25 in non-designated buildings—a slightly wider gap than the last survey. Once again, tenants rated BOMA 360 buildings much higher in overall satisfaction with the commitment to sustainable building operations. BOMA 360 buildings were rated 4.22 in this category as compared to only 3.91 in non-designated buildings. These findings are based on an analysis of more than 4,400 tenants in nearly 240 BOMA 360 buildings compared to the Kingsley Index℠, the largest and most comprehensive performance-benchmarking database for tenant satisfaction. For more information about the BOMA 360 Performance Program, please visit the BOMA 360 webpage.